For months since its initial announcement, many of use Warhammer fans – specifically the Dawn of War series – have been polishing our Bolter Pistols and Power Swords ready to step back into the fray of intense combat and bombastic war cries. We were ready to hear the battles cries; the stout Space Marines dedicating even the simplest of actions like walking to The Emperor, the Eldar’s call for blood be spilled for the Blood God, and of course the unforgettable WAAAAAAAAAGH of Orks. We were ready! For those who have never before played the Warhammer 40,000: Dawn of War series of games it’s worth mentioning that the genre of these games from Relic Entertainment has gone through some evolution over the years. 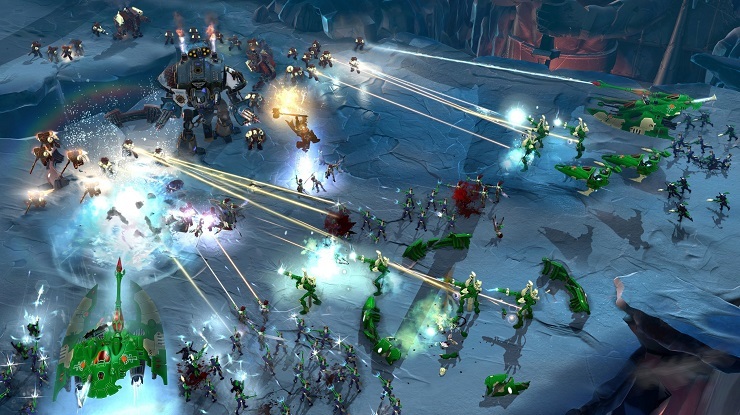 It started out as a run of the mill RTS with the characters and factions we’ve come to love in the series, scratching the itch for Warhammer fans who were sorely lacking a RTS in a time shortly after the huge success of Warcraft III. 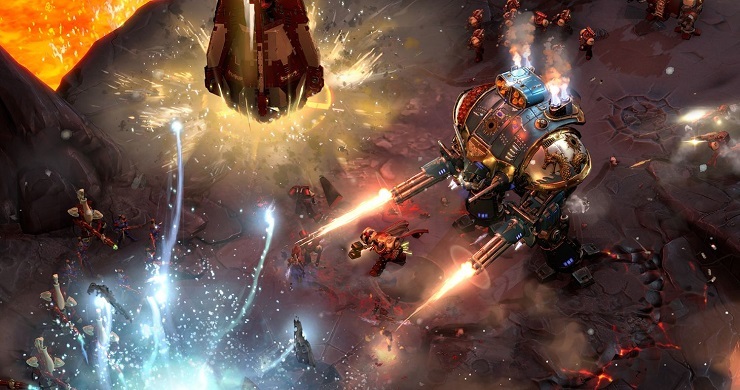 Dawn of War hit the market like a drop pod laden with Terminator Armour, bursting out with flair and war cries aplenty. It saw three expansions and became a beloved game among fans of Warhammer and the wider strategy gaming scene alike. After this success, Relic made a decision with Dawn of War II that was seen as something of a controversy. 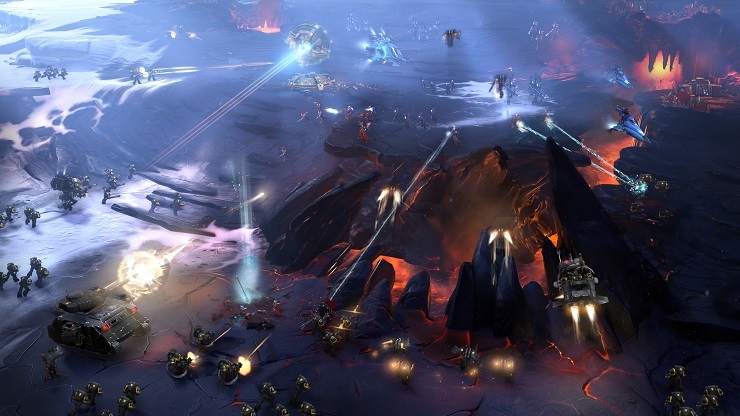 They moved away from the base-building and large armies staple of the RTS genre and moved to exclusively focusing on the Hero units, bringing your micromanagement to a maximum of four units per mission. This brought the narrative directly to that of the Commander – that’s essentially you – and the small group of rag-tag elite units that form the Blood Ravens. What we have now with Dawn of War III is an amalgamation of the two and, despite my initial reservations about this decision, they’ve really nailed the balance. There is undoubtedly something incredibly satisfying about seeing a huge throng of Space Marines trudging across the map smashing everything in their path, but what really gave me a sense of joy was seeing the Elite units being put into play among the throng. The prime example is Gabriel Angelos, the Chapter Commander of the Blood Ravens and one hell of a guy. He stands above every other unit swinging his power hammer as if it were made of plastic and smashing through Eldar, Orks, and even vehicles that dare to square up to him. It’s that sense of enhancement for your army. Although these Elite characters will not be able to break through the enemy, they’re a substantial chunk of your army’s power. Stepping into the main campaign missions, you start out as Chapter Commander of the beloved Blood Ravens: Gabriel Angelos. Gabriel is a certified badass whose honour and valour are second to none, disregarding orders placed before him in favour of being a big god-damnned hero. His hammer crushes Orks, Eldar, and anyone else that dare stand in his path. The pacing of the campaign missions is slow, allowing you to learn the finer points of the game’s mechanics of combining the earth-shattering power of your Elites and the micromanagement of base and army-building. The pacing of early missions is a jarring experience, however, putting you first in the Power Armour of Gabriel, then turning you green with Ork fury in the role of Gorgutz, and then the elegant yet wrathful Farseer Macha. I spent a long time on world-building and setting up of the overall story – which felt a little long-winded when you consider the target audience will be Warhammer veterans and those with an interest already. I don’t begrudge them for this, of course, but it could have picked up speed a little earlier in the overall narrative. It really does feel like the campaign is offering a step-by-step guide to teaching you all of the various unit types and different aspects of the army management – much like Call of Duty and Battlefield campaigns were the extended training manuals to Multiplayer, DoWIII feels like reading through the Codex Astartes before taking the Space Marine Graduation Examination. While there is a grand story with some incredible set-pieces and action sequences that made me giddy with joy, it left me wanting more. It was a production-line Warhammer story churned out en masse. For me I wasn’t expecting anything different, but would have loved for there to be a bigger splash made in the campaign. 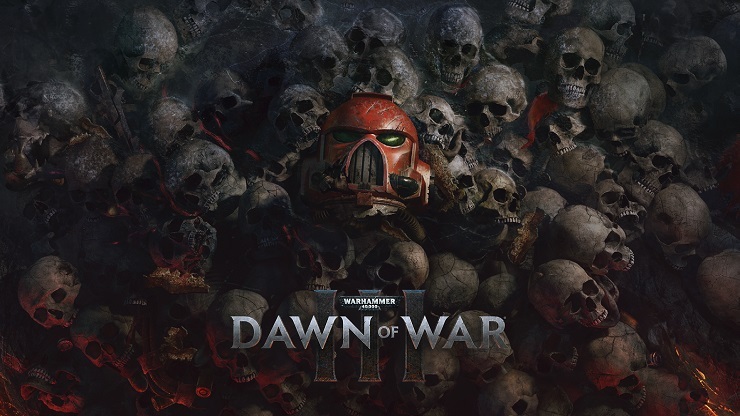 Dawn of War II took the Warhammer bombast really, really far and that was one of the things that really charmed me. It’s definitely been dialled back in DoWIII and although there is a small part of disappointment there for me, the overall experience and enjoyment was not affected. The game nigh-perfectly melds the play styles from its predecessors into a visceral and rewarding experience. Gabriel’s hammer connects with violent force to turn enemies into mulch, Gorgutz’s grapple stuns enemies caught in its radius, Jain Zar’s blades slices foes with murderous intent. Elite units are designed much like a MOBA (League of Legends, Dota 2) or Overwatch characters, with each with their own unique play styles and abilities at their disposal, and can be used for unstoppable and devastating effect. As an example, taking the Eldar Farseer Macha you can create a warp rift around you that freezes everything within the area of effect, rendering them (and her) completely open to attack and no option of retaliating until she moves or executes another attack. Couple this with the flare and lethal precision and speed of Jain Zar’s melee and you’ve got yourself a big ball of death waiting to be unleashed on your enemies while they’re completely incapacitated. It’s the equivalent of pulling off a synchronised attack with your teammates in a MOBA and wiping the floor with their remains. While these Elite units are unfairly strong, they cannot do everything themselves and thus will require an army. The army is essentially a means of providing your Elites with a little more firepower. You will want a steady stream of units in rotation to draw fire, apply extra damage, and deal with specialised enemy units that your Elites are ill-equipped to fight. The different units available to you throughout the game remain true to the Warhammer rules in their strengths and weaknesses to other unit types, and so careful consideration is key to success! Multiplayer is the biggest and, undoubtedly, the most important chunk of the game. My experience with it was a mixed one, but none of it was negative. The complete opposite, in fact! Even with the years of multiplayer FPS, RTS, and MOBA that I’ve played there have been a couple of matches in DoWIII that rank among the most adrenaline-filled matches I’ve played in a multiplayer game. You play 1v1, 2v2, or 3v3 matches against your enemy team with the intention of collaborating with your teammates and crushing your foes. It feels very MOBA-like in the game flow, and even in the win conditions of the Power Core mode. In short, break your enemies, break their shield generators, and break their Power Core all the while making sure they don’t smash your own and you win. You will know what you’re signing up for if you’re familiar with the Dota and League of Legends modes. As mentioned earlier your Elites are also designed with this kind of gameplay in mind, forcing you to think about synergies and possible counters. You pick your Elite units before you begin the match and this is where you first start to come up with some strategy for synergy with your teammates. I favoured the Eldar and went straight into getting hold of Jain Zar as soon as possible because honestly this Elite banshee is my favourite character so far. The game starts as an arms race of capture and control of resource points, which I often left to my teammates in 3v3 games and went on a mission to harass the enemies in any way that I could. Banshees, Dark Avengers, and Rangers aren’t the strongest units, but with their mobility and the Rangers’ ability to stealth, it was an annoyance that caused opponents headaches and afforded us some time. As the match progressions the tempo escalates with an increase in resource generation rates and the advent of more powerful Elites and upgraded armies. The combat is tense and often become a cacophony of Bolters, blades, Lascannons, flamethrowers, and everything else in between. Confusion is almost guaranteed! There is something of an issue with the power of the Elite units in the game currently, with their presence in multiplayer being something of an unmitigated tide-turner. While this is something that can create really emerging gameplay, it can create a never-ending back and forth that can work to drag out the game. This is purely balance, though, and I fully expect Relic to tweak these areas going forward when it reaches the public stage. 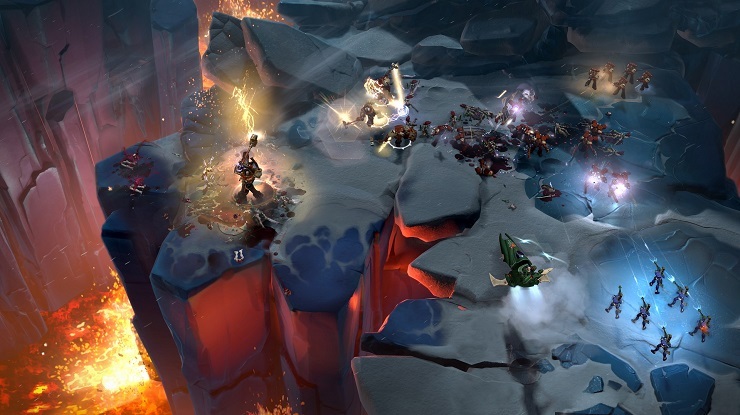 Veterans of the original Dawn of War will take to this game like stepping into their old Power Armour. Exhilarating, over-the-top spectacle, and meeting expectations like only Dawn of War can.